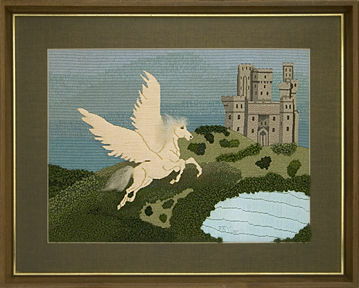 Pegasus was created as a gift for my husband and a companion piece for the unicorn I stitched as my final Canvas Mastercraftsman project. I have long been fascinated by mythology and these wondrous beasts and wanted to capture them in needlework. The wooded landscape he is flying over was created by couching wool threads that had been knotted together. The knotting began when the multiple threads became too heavy to work as French or Colonial Knots. The size of the knots increased as the landscape got closer to the viewer as they moved up the side of the mountains. The threads used were those readily available at the time the piece was created: crewel wool, embroidery floss, DMC metallic. My spouse was most gracious in granting permission for me to give the piece to the NAN collection.